At the age of seven, Shobha Rao moved from India to the United States and found herself in a world of wonder and discovery that’s never left her. In fact, as we’d discover in today’s conversation, she is so committed to presence and wonder, her cellphone has no internet, nor does she ever use her camera. And, when she teaches students, she invites them to have their heart’s broken by leaving their phones at the door. Obsessed with books, Rao eventually became a writer, won the Katherine Anne Porter Prize in Fiction, and her story “Kavitha and Mustafa” was chosen by T.C. Boyle for inclusion in Best American Short Stories 2015. 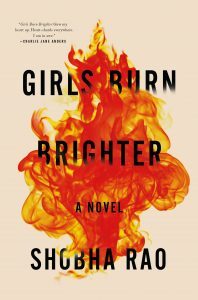 Her latest book, Girls Burn Brighter, is a heartbreaking and eye-opening exploration of friendship, sisterhood, patriarchy and the boxes society often seeks to put people in. Rao is currently the 2018 Grace Paley Teaching Fellow at The New School in New York City. NetSuite: Business management software on an easy to use cloud platform. Get NetSuite’s guide “Crushing the Five Barriers to Growth” when you go to NetSuite.com/GOOD now. Grove: Makes shopping for natural products EASY. Get a free $30 Mrs. Meyer’s gift set at Grove.co/GOODLIFE with your first order. ShipStation: Try ShipStation FREE for 60 days. Visit ShipStation.com, click on the microphone at the top of the homepage and type in GOODLIFE.